You're probably familiar with oregano, which is a culinary spice that adds flavor to many traditional Italian dishes. In cooking, the leaves of the Mediterranean oregano plant (Oreganum vulgare) are used either fresh or dried, and you can also brew them to make tea. In addition to their strong flavor, oregano leaves contain several medicinally active compounds. They are a traditional remedy in herbal medicine, and clinical studies on oregano's possible usefulness are lacking, but some evidence from laboratory research suggests that oregano tea may have significant health benefits. 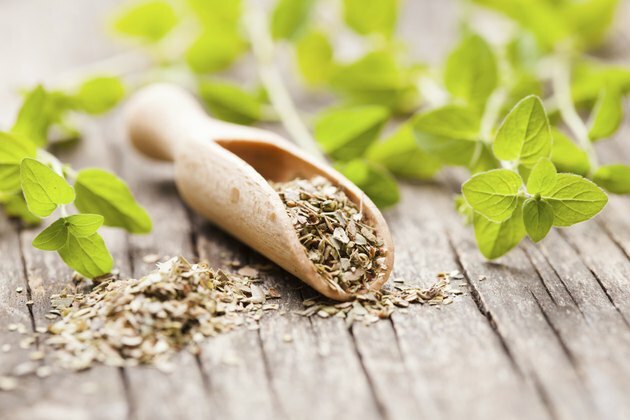 Oregano leaves contain more than 40 different compounds, according to a study published in the April 2011 issue of the "Journal of Food Science." Researchers found that many of these compounds belong to phytonutrient classes called polyphenols, flavonoids and anthocyanins, which are all recognized for their antioxidant qualities. Antioxidants help protect your cells from free radicals, which are unstable chemicals that form as byproducts of digestion, form in your skin when you're in sunlight and form in your organs when you're exposed to environmental toxins such as cigarette smoke. Over time, free radicals can damage cellular components such as membranes and DNA, raising your risk of chronic diseases that include cancer and heart disease. A number of studies conducted in the laboratory suggest that compounds in oregano might be potentially therapeutic against cancer. For example, a study published in 2009 in "Nutrition and Cancer" found that cultured colon cancer cells slowed their growth and eventually died when exposed to an oregano extract, compared to control cells. Another study published in the June 2008 issue of the "Journal of Pharmacy and Pharmacology" found that oregano extract improved indicators of cancer in laboratory animals who had colon cancer, an effect the authors attributed to oregano's antioxidant properties. Although these findings from the laboratory are encouraging, they still need confirmation in clinical studies with human subjects. Oregano may also have significant antiseptic properties, and may help prevent or slow the growth of potentially harmful microorganisms. The study published in the "Journal of Food Science" found that compounds in oregano leaves have anti-malarial properties and slow the growth of microorganisms that cause malaria. Another paper published in the January-March 2010 issue of the "Brazilian Journal of Microbiology" found that an oregano extract stopped growth in the laboratory of several types of Candida fungi that cause vaginal yeast infections. Although these are encouraging, the fungi studied were obtained from laboratory animals and more work is still needed to determine if oregano compounds are equally effective against these and other pathogens from human subjects. You can prepare oregano tea from either fresh or dried leaves, which are available at most grocery or health-food stores. Cutting or bruising the leaves before brewing may release more of the herb's compounds into the water. Steep 3 teaspoons of fresh leaves or 1 teaspoon of dried leaves in 1 cup of boiling water for 5 to 10 minutes. Oregano tea can be somewhat bitter, but adding sugar or sweetener can counteract this. The herb is generally considered safe and without any negative side effects, although no minimum effective dose has been identified. It might cause a rash or other reaction if you're allergic to the herb, and its safety during pregnancy or breast-feeding hasn't been established. Talk to your doctor about oregano to decide if it might be helpful for you. What Are the Benefits of Using Neem Leaves?